Why Use the Google My Business App? Google My Business (GMB) is an essential local search tool for updating your business information on Google, building out your online presence, and engaging with existing and potential customers. GMB’s full set of features can be accessed using the desktop version, but busy users can also access and manage their GMB accounts on the go using the Google My Business app for iOS and Android. Before you start using the Google My Business app, we recommend that you either claim or create your business listing on Google using the desktop version of GMB. Take the necessary steps to get your listing verified, too. When you download and launch the app on your device, you’ll be prompted to log in using the Google account associated with your Google My Business dashboard. Once logged in, you’ll be taken to the Home page of the app. Scrolling down takes you through a list of actions you can take to manage your business information on Google. Tapping the Menu tab on the upper left portion of the app shows you more options for attracting new customers and optimizing your business listing. With the Google My Business app, you can do a lot of the essential tasks related to managing your business information on Google. Update your business name, address, and hours. Your listing will rank higher in search results if you submit accurate, up-to-date, and consistent business information. Tap the Menu tab on the upper left portion of the app. Then tap Business Info. To update your business location as it appears on Google Maps, tap the Edit icon (pencil icon) on the lower right portion of the embedded Google map. To edit or update your business name, business categories, address, service area, phone number, or website, tap the corresponding Edit icons to the right of each information type. Create and publish up-to-the-minute content for people who find you on Google search. Remember: your Google business listing also acts as a kind of content feed on which you can create and post up-to-minute content for your audience. Content (“posts”) can be in the form of text, video, or photo, which customers will see when they find your business listing on Google. Go to the top of your GMB app’s Home page and tap “Create a post”. Alternatively, you can tap the blue and white + icon on the lower right side of the app. You can also tap the Menu tab then tap Your posts. Manage and respond to online reviews on Google. The Google My Business app is also useful for tracking and responding to online reviews on the go. Tap the Menu tab and tap Reviews. The Reviews page shows you all customer reviews posted on your Google business listing, organized by date. Each individual review includes an option for either responding to the review or editing a previously submitted response. Check out custom insights on where and how many people are searching for you. Because many customers find businesses on Google Search and Maps, the Insights page on your Google My Business app focuses on how customers use Search and Maps to find your listing, and what they do once they find it. Get notified of new activity on your Google business listing. The Google My Business app is a great tool for monitoring the latest activity related to your listing. Tapping the Notifications tab from the Menu gives you an overview of your latest reviews, insights on your most recent posts, bookings, payments, and product updates. You can even set up custom notifications, so you get notified of activities that matter the most to you. From the Menu tab, tap Settings. Then tap Notifications. Choose the types of alerts you want to receive on your device. 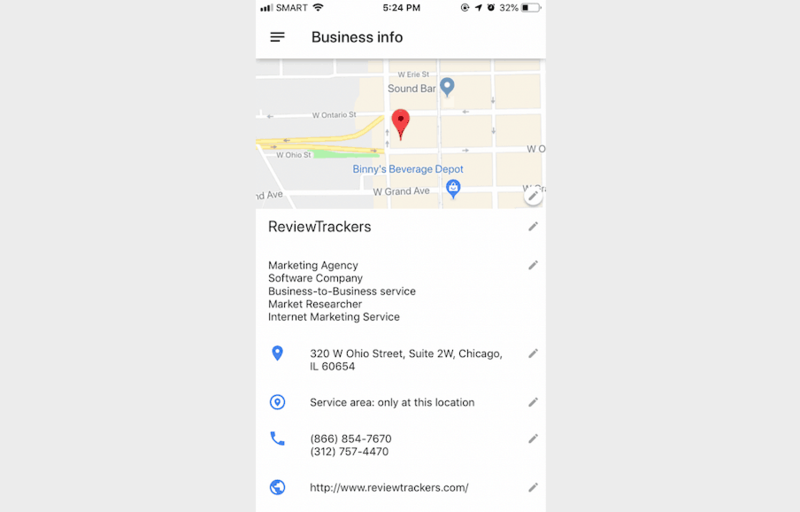 Google My Business app can send notifications for customer reviews, bookings, payments, photos, listing health, insights, product updates, and posts. This is the place where you’ll add or edit any listing information. Any changes made in this section appear on both Google Search and Maps, which should make managing your listing a bit easier. Any information or interaction with customers is the appropriately-named “Customers” tab. You can use this section to post special offers to those who follow your GMB profile, or you can use it to simply respond to customer reviews. In the future, Google plans to also add more functionality in the “Customers” tab so that you can also use it to respond to anyone who sends you a message through your listing. A well-managed listing on Google My Business can foster significant improvements in local search performance. If you’re rarely at your desk and always on the go, you can use the Google My Business App to update your business information, respond to reviews, post relevant content, engage with your audience, and gather actionable insights about the people searching for and viewing your business listing on Google.